Vera Lynn (born Vera Margaret Welch in 1917) is perhaps best recognized as England’s number one morale builder during the Second World War. She will certainly be immortalized by such hits as The White Cliffs of Dover, Wishing, and We’ll Meet Again. But beyond being an inspiration to the British Expeditionary Force, she must certainly be credited with being one of the most sincere and artistic popular singers of the twentieth century. Now into her eighties, the sweetheart of wartime England still makes the occasional public appearance, and was honored by Queen Elizabeth by being created DBE in 1976. This collection of twenty-five of her earlier hit records comes to life quite well under the skilled hands of Peter Dempsey, who has lovingly transferred these sides from their original 78 r.p.m. format. The sound quality is vibrant and alive, and Dempsey has done splendid work on bringing out the truly delightful orchestrations that accompany Ms. Lynn’s warm, rich mezzo-soprano. 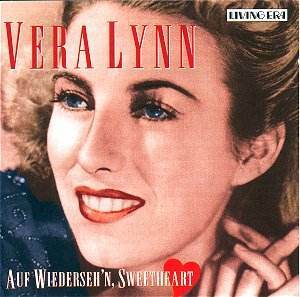 If one were to select a single adjective to describe Vera Lynn’s singing, I think that sincere would have to be the top choice. There is nothing pretentious or overly stylized about her approach to these tunes, some of them classics of popular song (A Nightingale Sang in Berkley Square) and some of them a bit over the top in sentimentality (It’s A Lovely Day Tomorrow.) Of especial interest are the two covers of songs already made famous by Bing Crosby, The Bells of St. Mary’s and Mexicali Rose. Lynn makes these songs all her own without a hint mimickry. They become fresh and new in her hand. One of the things that I have always found missing from contemporary renditions of standards is the attention to detail in the orchestration. Too often the modern pop singer will record a set of standards with only piano or a small combo to accompany them. In many of these recordings, the orchestra plays as important a role as the singer, with entire "verses" as it were, being given over to the players. Particularly fine in this regard are the numbers that Lynn recorded with the Mantovani orchestra, and specifically noteworthy are That Lovely Weekend and the wartime heart-warmer When the Lights Go On Again. Peter Dempsey provides an interesting and informative program note, and production values from ASV/Living Era are of the first order. Highly recommended to anyone who wishes to discover truly artful song writing and performing. For those longing for a large dose of memory and nostalgia, this is a must have.